I have a thing for Easter baskets. 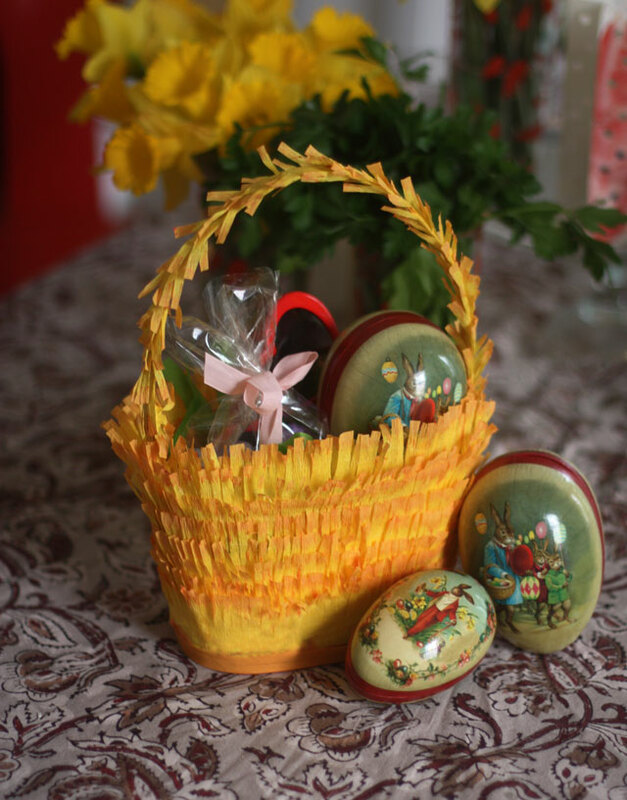 Big ones, small ones, inbetween… Man, I love an Easter basket. At any given time you will find 20+ Easter baskets in my pantry filled with canned goods and dish towels and everything in between. Not a chocolate bunny in the bunch, sadly. 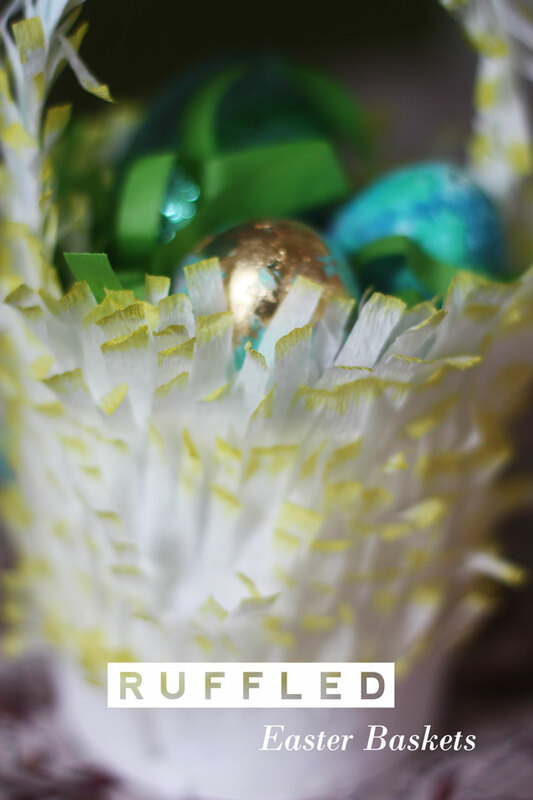 Easter and ruffles go together like peanut butter and jelly. They are meant to be together! These were crazy easy to make and totally free. 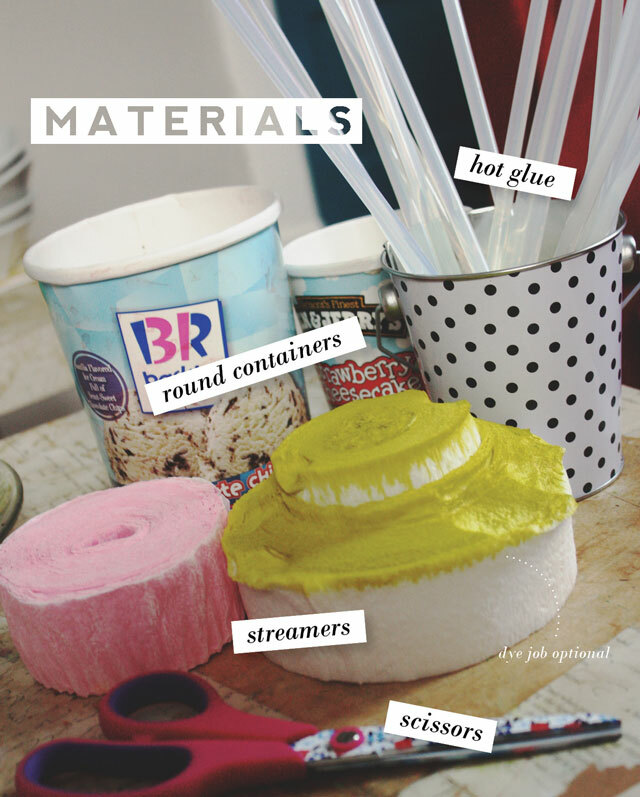 Leftover party streamers + ice cream containers + hot glue = Shazam. You may or may not want to trim the carton down a bit. Shallow baskets show off the goods a little more, and the trimming can be used for the handle. Personally, I like extra deep baskets as they allow for more chocolate. You can tell where my priorities lay. For a small basket, you will want two to three yards of fringe. Making the fringe is easy, just snip up some old streamers. Am I the only person who keeps streamers after the party is over? 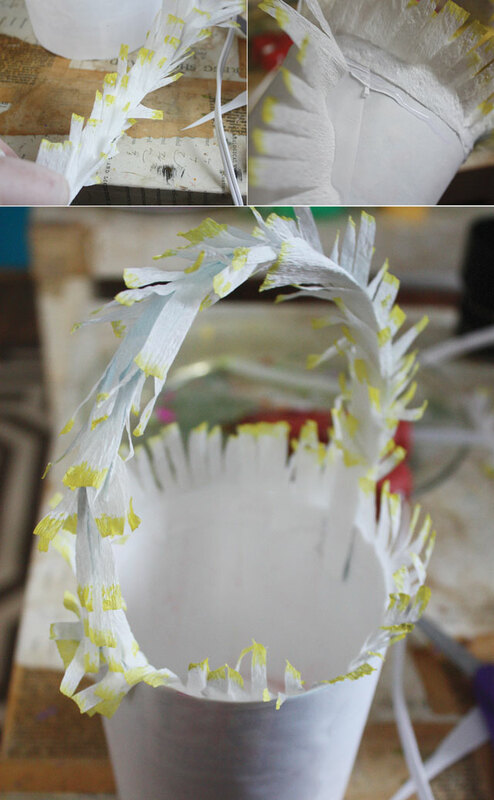 Before hot gluing the streamers to the carton, I suggest adding the handle first. Or not. 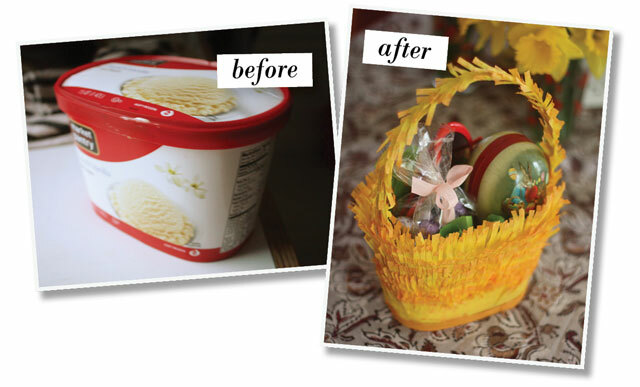 Who says Easter Baskets must have handles anyway? 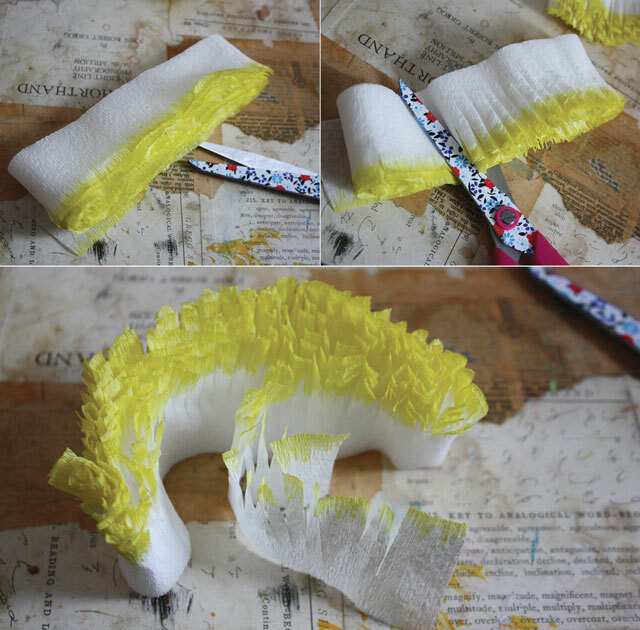 As you might have noticed, for emphasis, I dyed the edges of my streamers chartreuse. How’d that happen? 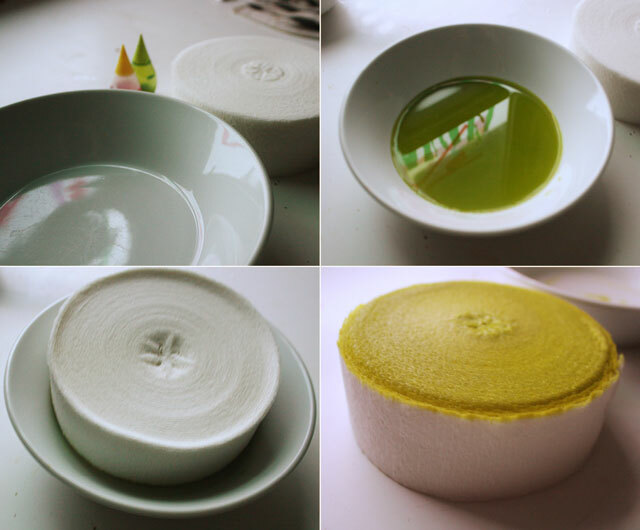 Ten drops of food coloring + 1/4 Cup water in a shallow dish. Soak the streamers in the dish for a few seconds, then dry over night. Don’t have overnight? Ten minutes in a 200 degree oven will do it. I just know you always wanted two-tone streamers. Same issues here. I will eat ice cream in the name of Easter any time. Any holiday. The two tone streamers are genius!! You’re sooo not alone. In my closet there is a box of double-layer, extra-ruffly streamers from camp last summer. Reused for a birthday party, and again for New Year’s…they rock. Wahoo, glad we are in this together! Such a brilliant idea! 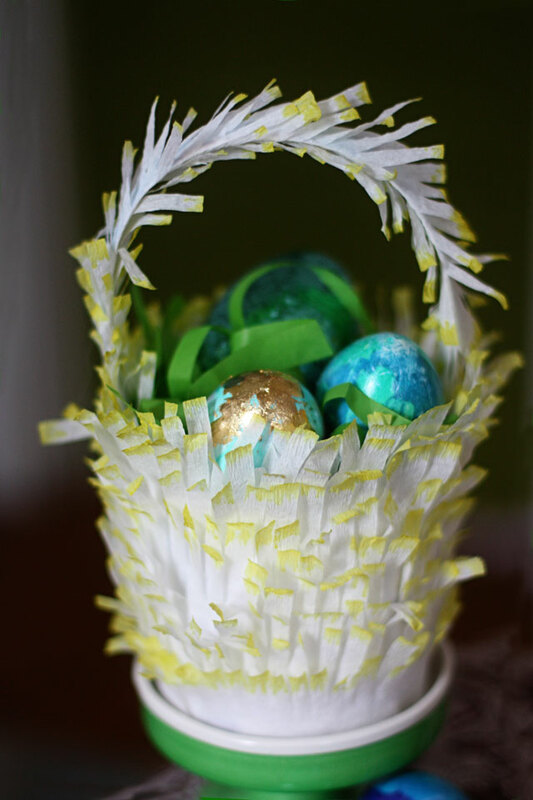 I’m obsessed with baskets so the prospect of making my own excites me! 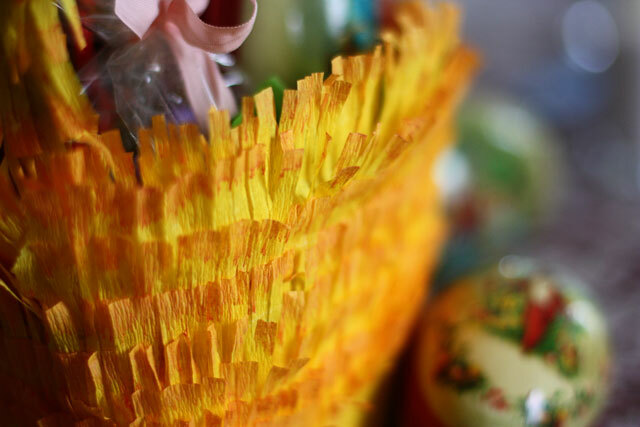 By the way, I’m totally going to stock up on Easter baskets this year for storage purposes–because bright colors + clearance prices = win! Go for it!! Target always has nice baskets on mega clearance the Monday after Easter. I have also found stacks of the same Target baskets at the Salvation Army by May (they must have some sort of tax-write off relationship). Hope you find some! Light, airy, Spring-y… I like! Think I’ll employ my local GrandLoves to whip up a couple during egg-dying day, tomorrow. No streamers lying around the house; but we’ll find something suitable. 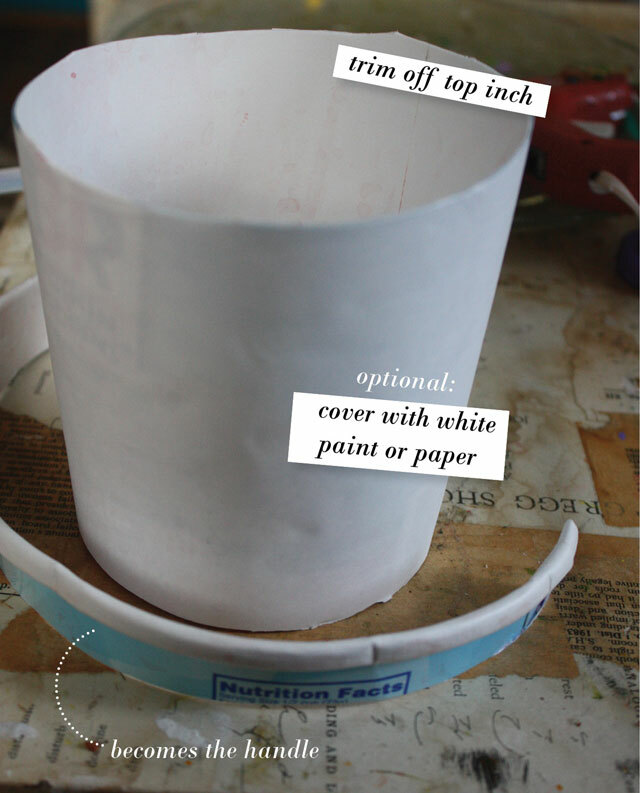 Dyed, fringed coffee filters? Newspaper funny pages? Happy Easter, Auntie Peaches. I just love how you recycle. Of course your creativity with paper is truly inspirational. Thanks for sharing.